Usually the grub screw is directly behind the tap. If you run your finger around the back of the tap where the spout meets the base you should be able to locate it. You will then need to undo the grub screw with an allen key or appropriate size screw driver depending on the size of the grub screw. If the grub screw is a cross head one you will need an offset screwdriver. Once the grub screw is removed the spout should just pull straight up though it may need some persuading. 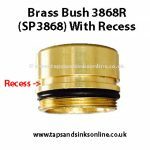 In some taps it might be hard to find the grub screw as it looks like there is a locking nut (like a wide ring) but if the locking nut won’t turn then this might be held in place by a grub screw which will need to be removed. Unscrew the “shroud (locking nut)” that sits at the base of the spout by turning it anti-clockwise and then pull the spout upwards and out. This would apply to all UK Kitchen taps without grub screws where there is a locking nut. If your Kitchen Tap has neither a grub screw or a locking nut holding the spout in place then the spout has been designed in such a way as to remain inside the body of the tap by the shape of the spout and the O Rings. This might prove more difficult to remove and you might damage the spout unless you pull it upwards evenly because if this is not done properly you might strain / damage the spout. Some of these Spouts are designed as a ‘Push and Screw’ Spout to remove the Spout. We always recommend consulting a plumber if you are unsure or are having difficulty removing spare parts lest you damage your tap, as this is only general advice applicable to a wide range of Taps. We also have a Blog How to change a Kitchen Tap O Ring Kit. PLEASE NOTE: This blog doesn’t cover every style of Kitchen Tap. Some Top Lever Single Lever taps have the spout grub screw concealed behind the indicator in the front. Other Top Lever Single Lever Taps would involve removing many parts e.g. Head, Dome, Cartridge etc before you can gain access to the Spout. I have a Franke Rotaflow Mixer tap circa 2000 and I cannot for the life of me get the spout to come out of the base despite following your instructions. The spout comes out up to a point and then is stopped. There are no visible grub screws and I’ve rotated the spout degree by degree and pulled upwards and wiggled at every point for the full 360°. It seems to be retained by something but I can’t work out what. Did Franke ever make this tap such that you couldn’t remove the spout? Do you have any other tips. I don’t want to have to replace the tap or get a plumber in if I can avoid it. 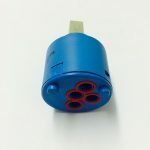 HI Mike, if you can give me your order number for your Spare Part Purchase so that i have all your details then I will get our Technical Team to contact you. When I tried to remove the spout (which was before I found this new addition to their instruction sheet)I didn’t find any grub screw – perhaps it is located well down on the normally concealed part of the spout. If you ever succeed in removing the spout I would appreciate an email telling me how to do it. I have the same issue with a Franke Davos Kitchen Tap Spout SP3577. Would be grateful for advice. HI HTDearden, this Blog Post here : How to remove a Kitchen Tap Spout should answer all your questions as it takes you through each step in detail but please come back to us if you still have any queries. Hi, I’ve got a leaky Nabis Aries Basin Mixer in my kitchen and I’m trying to replace the ceramic cartridge or the o ring. I’ve undone the grub screws but the cross heads won’t come off. There is no corrosion on the taps & I’ve only had them for about a year. I’ve tried using a flat head screwdriver to lever the handle off the top of the stem, but this did not work. Do you know what else I could try ? I am sorry Doug but I am not familar with that tap so I can’t advise you. You could go back to where you purchased it from and ask them how to remove the handles. You could also look at our blog here How to remove handle on your Kitchen Tap to see if that helps you. 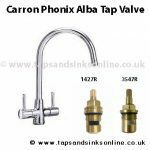 Hi Peter, can you please email sales@tapsandsinksonline.co.uk with a picture of your tap and any other information that you have on this tap e.g. approx installation date. 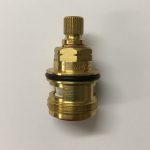 To change O Ring Kit , here is our blog post How to change a Kitchen Tap O Ring Kit which should give you all the information that you need. Do you know how to get spout off the original Franke Fuji kitchen tap. No sign of a grub screw found. Thanks. How old is your tap as the Fuji from 2003 onwards definitely has a grub screw. If there is definitely no grub screw then you would need to consult a plumber as in our experience, these older taps designed without a grub screw or locking nut are designed in such a way as for the Spout to stay in place and once the spout is pushed into the tap, the o ring expands in such a way that it is extremely difficult to pull back out. I think you need to consult a plumber but I would also make sure that you had the spare parts to fix this tap in the first place before going at removing the spout if your tap is that old i.e predates 2003. Hello, I have a Franke Davos tap that is leaking where the spout meets the base. It does not have an Allen key or shroud fixing to unscrew. Does the spot just pull out to replace the O rings ? Any advice would be helpful. 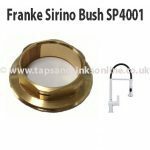 HI Kieron there are several variations of the Franke Davos Tap and I don’t know which one you have as you haven’t specified the age of your own Tap or sent a picture. However, there is one Davos Tap, Production date (approx.) 1990 – 2000 that has a push and twist Spout.